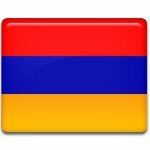 Army Day in Armenia falls on January 28, the date when the army of newly independent Republic of Armenia was formed in 1992. The Armenian Army is the largest branch of the Armed Forces of Armenia. It consists of ground forces, that are responsible for the land-based operations, and air forces. The Armenian Army was established on January 28, 1992, several months after declaration of independence from the Soviet Union. The Armenian Army went through three phases of development. The first phase began in February 1988, when Nagorno-Karabakh conflict outbroke. The second phase began after proclamation of independence. And the last phase began after the end of the Nagorno-Karabakh conflict. Nevertheless the Armenian Army is relatively young, it collaborated in several military international missions. It deployed a platoon unit to Kosovo as a part of the Greek peacekeeping battalion in 2004. The Army participated with the International Security Assistance Force in the War in Afghanistan. Over 1,500 Armenian officers were sent in Russia and Greece in conjunction with the strategic allies. A joint partnership was established in 2004 with the Kansas National Guard in order to exchange knowledge and experience and facilitate cooperation in civilian affairs and national security.